The term “Maroon” derives from the Spanish cimarrón meaning “fugitive, runaway”, and literally “living on mountaintops”; from the Spanish word cima: “top, summit”. In colonial societies based on slavery the Maroon phenomenon can be seen worldwide, where fugitives from colonial tyranny upped and left to establish fugitive communities far from the reach of the colonial authorities. These Maroon communities made up of fugitive slaves, indigenes, Free Blacks, escaped convicts and rebel Europeans often thrived and prospered. In the Cape the earliest Maroon community in fact developed in pre-colonial times, but as a result of the passing shipping, doing stop-overs in Table Bay, in the two centuries before 1652. Those Marooned Khoena who were from various nomadic clans who visited Table Bay, but who left their clans for various reasons and lingered on permanently around the Camissa river mouth and seashore to conduct trade with these ships, became known as the Goringhaicona (lit. lost children of the Goringhaiqua). But most Maroons at the Cape were fugitive slaves, Free Blacks, escaped convicts and rebel Europeans who moved far away. The first Maroons were noted as fleeing to hideaways on Table Mountain where their cooking fires could be seen as dots of light all over the mountainside at night. The two most famous getaways were Cape Hangklip community and much further way – the Gariep River communities, but there were many more. The Eastern Cape Rharhabe King Ngqaika also gave refuge to Maroons. At the Cape there was a local term for Maroons. They were collectively called “Drosters” and the Drosters are a major part of our history and heritage. Again, this part of a hidden history and heritage which deserves greater recognition and exposure. The most famous of the Droster communities in fact were the first to establish what was effectively a proto ‘Coloured’ nation and nation-state, and formally independent territory – before the Boer Republics – the Griquas and Griquawaland. The various Droster Bergenaar Baster communities came into coalition, dropped the derogatory term Baster, renamed themselves by part using an old clan name associated with the first Adam Kok’s royal Gagariqua wife and launched the Griquas with their own constitutional framework. They went on to adopt all the trappings of state including coinage and stamps, and an independent Griqua church, before this prosperous and coherent community were sold out by the British in an appeasement process to the Boers of the Free State. A later attempt to establish an East Griqualand revived state was crushed, Europeanized and after the rebels were rounded up for sedition and leader Cecil le Fleur incarcerated at the Breakwater prison in the Waterfront – the bulk of the Diaspora community were dispersed across the Western Cape. There are so many different, interesting and complex stories of Maroon or Droster communities that are a part of our heritage that it is not possible for a short FB posting to cover. In some cases entire communities of Khoena, such as the Goringhaiqua and the from the Cape Peninsula and West Coast upped and left as fugitives from the colony to form fugitive communities such as the Korana and the Witboois at the Gariep River. Others formed fearsome horseback riding nomadic clans such as the Orlams Afrikaners, the original Afrikaner proto national group who were people of colour. These preceded the adoption by the Boers of the term “Afrikaner” more than a century and a half earlier. Fierce rivalry developed between different Maroon communities such as the Springboks, Orlams Afrikaners, Witboois, Bergenaar Basters, Korana and others, all of whom kept livestock and hunted along the vast expanses of our own Wild West. Our historians became so bogged down and besotted with the fortunes of British conquest on the Eastern frontier that the evolution of communities of colour on the wide and inhospitable West of South Africa remained largely ignored. Maroons from three origins in the Eastern Cape are also a big part of our history and heritage. Firstly Maroons like Coenrad de Buys give us a fascinating insight into rebel trek-Boers who made common cause with, and assimilated into, communities of Colour. Coenrad was a tall Boer who took wives who were slaves, Khoena, amaXhosa and from every people that his wandering life led him to engage with. The de Buys clan today numbers many, many thousands. Maroons like Herman Matroos assimilated into Khoena and amaXhosa communities and rose to be a major resistance leader in the frontier wars. This was one wave of Maroons from the Cape Colony. Then there Maroons from the inter-kingdom conflicts amongst the various Eastern Cape Nguni groups and also thirdly the Maroons from the British conducted wars of conquest and genocide in the Eastern Cape. Many of these also joined the Maroon communities on the Gariep, particularly the Griquas. Additionally there was another completely different type of Maroon. Those marooned shipwreck survivours on the wild coast who over century were taken in by various local communities in the Eastern Cape. These were European and Asian shipwreck survivours who were given hospitality and continued for the rest of their days totally cut off from other Europeans. They married into various Eastern Cape kingdoms and indeed some, like the shipwrecked British girl, Bessie, grew up and married into the Tshomane royal family. Clans like the amaMolo and abeLungu and others are rooted in these relationships. This aspect of our history and heritage is subject of a great book by Hazel Crampton – The Sunburnt Queen. More about the Gariep frontiers communities can be read in Nigel Penn’s outstanding book on the subject – The Forgotten Frontier. Amongst the seven tributaries to our heritage and identity, that of the “Maroons” also known as “Drosters” is perhaps the least explored. It is the arena in which the indigene Khoena people embraced and gave refuge to others and provided the binding cement and cohesion for survival and indeed prosperity. This was a cornerstone in the emergence of a distinguishable set of communities who were labelled ‘Coloured’ by the successive British administrations. 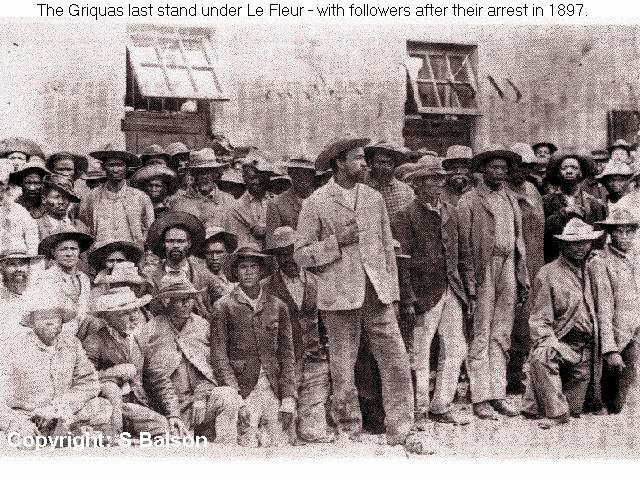 *PICTURE: East Griqua Kaptein Cecil le Fleur and his resisters after their arrest for sedition in 1897.